Number 1: Alexander Gauge's Friar Tuck was as popular a character in the 1950's television series as Robin Hood himself. He is the most popular Friar Tuck of all time. Every schoolboy in the land chuckled at, and identified with, his seemingly insatiable desire for food and drink; a recurring theme in U.K. pre-adolescent humour, from Billy Bunter to Desperate Dan. But Gauge's Friar is an intelligent man, rarely engaging in combat, and rather using his wily skills in negotiation together with a sound knowledge of the law, to reach his goals. Number 2: Michael McShane played Friar Tuck in Robin Hood Prince of Thieves (1991). The film itself has many disappointing aspects, but McShane is not one of them. Here we see all those characteristics of Tuck which occur in the legends; not just a jolly fat man, but a cantankerous, moody, even lecherous Friar, quick tempered, with a love of alcohol, and yet a devout holy man. (There is an interesting sub plot here as Friar Tuck wrestles with his personal concerns about a Muslim outlaw joining the group). Number 3: James Hayter played Friar Tuck on more than one occasion, but it is for the Disney production The Story of Robin Hood (1955), that he will be remembered, rather than A Challenge for Robin Hood (1967). He also appeared in the 1950's television Robin Hood series in the role of a miller. Hayter's interpretation of the Friar is outstanding in the Disney film, establishing perhaps more than any other actor a public perception of the character which persists to this day: Comical, greedy, quick tempered, but above all lovable. This was after all a film for all the family. Number 4: Ronnie Barker provided Robin and Marian (1976) with a much quieter Friar Tuck than is usual. Barker manages to hold himself in reserve in his portrayal of the final days of Friar Tuck, avoiding the excesses normally associated with his television performances as a comedian, and the result is intriguing. A small part in an excellent film and one which comes to mind long after the film is over. Number 5: Eugene Pallette played Friar Tuck in The Adventures of Robin Hood (1938). 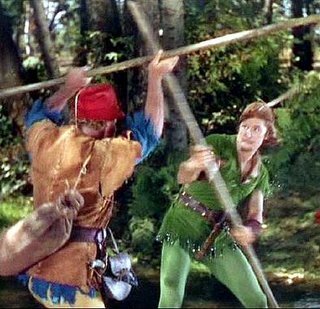 This was certainly not the first successful Robin Hood film, but it was the first major success to have sound, and as such it's interpretations of the characters would be influential for decades to come. Pallette's interpretation is quite faithful to the legend; a good swordsman, grumpy and greedy. But it does lack the humour, warmth and charm of later adaptations. Click here to read about how Robin Hood met Friar Tuck. Click here for more Friar Tuck pictures. Walt Disney The Story of Robin Hood (1952), was the first of two Disney Robin Hood films. It is in much the same style as other adventure films they produced in the 50's, such as Treasure Island, and Swiss Family Robinson. But since the release of their second Robin Hood film, the cartoon version of 1973, it has largely been neglected. This is a great shame, because The Story of Robin Hood is a worthy addition to the genre and has many good qualities. Firstly, it brought a youthful quality to the legend, particularly in the casting of Joan Rice as the "tom boy" Maid Marian who gets to wear Lincoln green, (something Olivia de Havilland would never have done in the Errol Flynn version!) 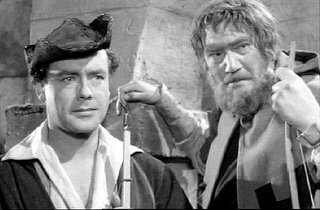 Secondly, the casting of British actors Richard Todd as Robin Hood, and Peter Finch as the Sheriff of Nottingham, with James Robertson Justice as Little John, helps infuse a more English quality. The same can be said of the scale of Sherwood Forest as depicted here, and which some Hollywood versions will insist on turning into Tarzan's jungle. In this respect the settings for Robin Hood's encounters with Little John and Friar Tuck are very pleasing. Made with family entertainment in mind, all the essential ingredients of the legend are here. 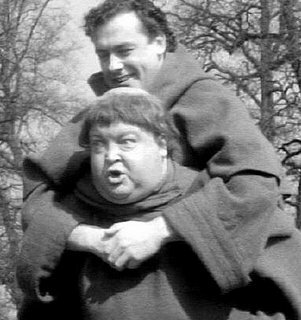 Of particular note is the excellent performance of James Hayter as Friar Tuck, easily the film's strongest role. The Story of Robin Hood is also responsible for making Alan A Dale such a well known outlaw. His ballads are used here to link many scenes in "ye olde English" style. But the film is not without its faults. Peter Finch, usually an accomplished actor, makes little impression in his role as the evil Sheriff, and James Robertson Justice makes no attempt to hide his educated Oxford accent, making his Little John faintly ridiculous. The success of this film was no doubt an influence on the direction the Richard Greene television series which would follow. In fact Archie Duncan, later to play Little John in that series, appears here as the villain Red Gill who attempts to assassinate Robin! (See comments box for more cast details). Robin Hood would have needed a strong and loyal second in command. Keeping order of a band of outlaws, enforcing the principle of giving to the poor what they took from the rich, would not have been an easy task. Robin came across the ideal man for the job in John Little, an excellent swordsman and archer who stood just over seven feet tall, with scrawny beard and unkempt hair. It was a brave man indeed who would dare face up to John Little. But to test his skills, that's just what Robin Hood had to do. Their initial encounter took place on a narrow bridge over a stream. (Probably the River Leen as seen on THIS LINK). Neither man would give way and let the other pass. Robin Hood drew his bow in anger. John thought him cowardly, having no bow himself, and challenged Robin to settle the dispute with quarterstaffs. A long hard fight ensued in which both parties took injury before Robin was finally defeated and thrown into the river. Will Scarlet and the rest of the outlaws then appeared from the forest, threatening to kill John Little. But Robin, recognising what a fine lieutenant John would make, invited him to join his merry band, and wear the Lincoln green. 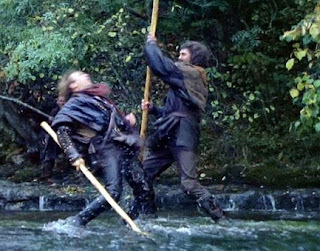 It was at this point that Will Scarlet gave John Little the name of Little John, the man destined to become Robin Hood's most loyal friend and second in command of the Merry Men. Today Little John's body lies in an outsized grave in a Hathersage churchyard. (See THIS LINK). Top: Robin Hood Prince of Thieves. Bottom: The Adventures of Robin Hood (1938). 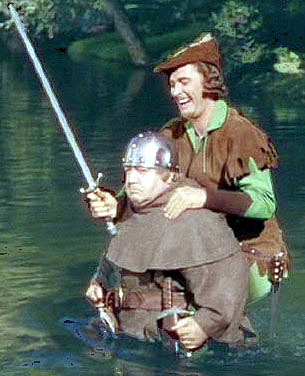 See also: Click here and here for more pictures of Robin Hood and Little John.